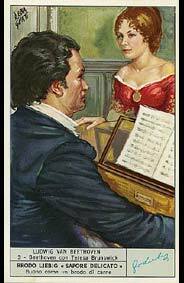 The 330 series of Italian Liebig cards are about Beethoven. There are six cards. Actual size of cards : 7 cm x 11 cm. 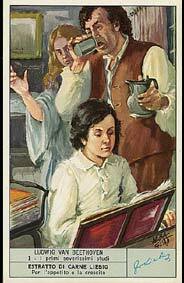 Of Felmish origin, Ludwig van Beethoven was born at Bonn in 1770 where his grandfather had moved after 1732. His father, Johan, tenor at the Court, realised that his son had incredible aptitude for music, and gave him rigourous musical studies, in an attempt at creating a child prodigy. Beethoven was taught first of all by an oboeist, Pleiffer, then by Christian Neefe who gave him his first instruction in harmony and counterpoint and intorduced him to the music of Carl Emmanuel and Jean Sebastien Bach. In this very young and promising student, Neefe recognised a new Mozart. Beethoven composed his first work in 1782 entitled "Variations on a Dresseri march". Becoming violinist in the court orchestra, he learned the works of Haydn, Caldara, Pergolesi and took an interest in Vienese and French musicians. 2. Improvisation in front of Mozart. 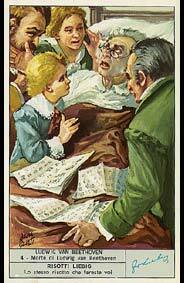 Desiring lessons from Mozart, he went to Vienna in 1787, but he stayed very little time, because he had to return to the bedside of his dying mother. Unfortunately another blow struck him: his father lost his familial rights due to alcoholism. The composer therefore had to submit to the needs of his family. However, even if the responsibility of "Pater familias" was heavy, Beethoven did not neglet his studies, and in 1789, he took up philosophical studies at the University. His friendship with the Breuning family dates from this period. At the beginning of 1792, thanks to a study grant from the Count F. van Waldstein, he returned to Vienna and took lessons from Haydn taking with him the phrophetic words of his benefactor: "Dear Beethoven, you leave today for Vienna. Mozart's genius still grieves and weeps at the death of his possessor.. Of course, the unstoppable Haydn has given him a refuge, but no job. Somehow he searches to find unity with someone new. 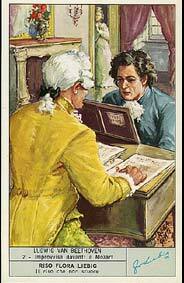 Thanks to working without respite, you will receive Mozart's spirit from Haydn's hands." His teaching was completed by Albrechtsberger for counterpoint and by Salieri for vocal writing. 3. Beethoven with his student Teresa Brunswick. Introduced into high society as a virtuoso pianist , he gave his first concert as pianist and composer on March 29th 1795. He also performed, always very successfully, at Nuremberg, Prague, Dresden and Berlin, where he played in the presence of Frederic Guillaume II. It was in this mundane period of his life, that Beethoven showed violent passion for certain students of his: Giuletta Guicciardi, Teresa Brunswick, Bettina Brentano, Theresa Malfatti, Amalia Sebal and the singer Maddalena Willman. One of these women is perhaps the "immortal loved one" to whom Beethoven wrote a passionate letter, found after his death. Certainly little is known about the romantic side of this great composers life, because his feelings of passion did not last long, and he never fell in love with 'appropriate' women. His love, his succes and his triumph did not, however, compensate for his dramatic secret: his progressive loss of hearing. 4. The death of Ludwig van Beethoven. Trapped in the solitude of deafness, he thought of committing suicide, but his passion for music, his desire to be witness to human fraternity gave him the will to live. The Heiligenstadt Testament, written to his brothers in 1802, is at the same time an explanation of his suffering and his force. He was always comforted by the attentions of his loyal friends, amongst them, the Brunswick family, his student the Archduke Rodolphe (later Archbishop of Olmütz), to whom he dedicated his "Missa solemnis", the Prince of Lichnosky, the violonist Scuppanzich and the conductor Schindler, his future biographer. 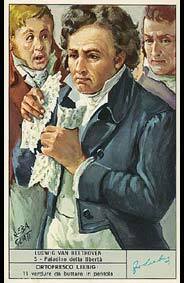 He died in Vienna on March 26th 1827 surrounded by the loyal Stephan Breuning, Anton Schindler and Sall. The funeral orasion was read by Franz Grillparrer, a great admiror of the musician. 5. Paladin of Liberty, Beethoven tears up his dedication of the Eroica Symphony written for Napolean. Beethoven's creative works began around 1796 with the trios opus 1 n°1, n°2, n°3, and then the three remarkable sonatas for piano of opus 2. In 1802 he composed his second symphony, the ballet Prometheus, his short but extrodinary work 54 and finally the Third Symphony in E flat major, opus 55, "the Eroica". The original dedication to Napoléon Bonaparte who, at this time represented, to Beethoven the paladin of liberty and republican ideas, was ripped up by the composer when he discovered that the first counsillor had named himself Emperor of the French. Between 1804 and 1810 the composer's terrible fight against progressive deafness showed itself in his works teeming with ideas of good and justice, creating his message of the horror of human suffering. 6. 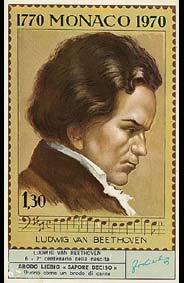 Commemmorative stamp celebrating the 200th anniversary of Beethoven's birth. Among his most significant works, we remember the Fourth and the Fifth Symphonies, Fidelio, Egmont, the concerto for piano opus 73; after the Fifth Symphony, a vibrante depiction of life as a fight, comes the "Pastorale" which signifies the triumph of inner peace, dominating and vanquishing the contrary forces of destiny. The Seventh Symphony is, as Wagner said, "the pinnacle achievement of dance", where Beethoven's interior world wakes up, a world extraordinarily rich in joy and light. Shortly before dying, he composed his five last quartets and his four last sonatas. The Missa Solemnis and the Ninth Symphony conclude the incredible creativity of this genius of music.